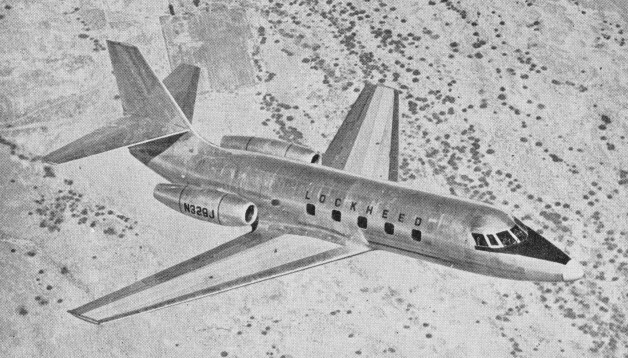 To meet a US Air Force requirement for an 'off-the-shelf' high-performance light transport, Lockheed developed the Lockheed 1329 JetStar. A low-wing monoplane with swept wings and swept tail surfaces, the JetStar was powered in prototype form by two 2200kg thrust Bristol Orpheus 1/5 turbojet engines. The JetStar flew 241 days after design began, in 1957. The first of two prototypes was flown on 4 September 1957, with flight testing proving satisfactory, but when planned licence-production of the Orpheus engine could not be finalised. Lockheed chose to power the initial production version by four 1361kg thrust Pratt & Whitney JT12A-6 engines, mounted in pairs on each side of the rear fuselage. The anticipated military demand failed to materialise in any significant numbers, with the result that the majority of the 204 JetStars that were built, before production ended in 1980, were sold as business/executive aircraft. 1977 LOCKHEAD JETSTAR II; A truly one-of-a-kind 12 passenger aircraft (including crew of 2 pilots and 1 flight attendant), powered by four 3,700 lbf (16.5 kN) thrust Garrett TFE731-3 turbofan engines and fitted with revised external fuel tanks. This is one of only 40 produced between 1976-1979, hand built in Marietta, Georgia USA; 30 still flying! AiResearch Aviation Company's 731 JetStar made its first flight on July 10 1976 from San Antonio, Texas. The TFE 731 is 10 inches larger in diameter than the JT12A, so the drag produced from the larger nacelles needed to house it would lessen the benefits of its lower fuel consumption. Also, the modified aircraft weighs 1,750 pounds more than its predecessor, so the gross weight would have to be increased in order to retain the same payload, but a high-er gross weight means more drag. The TFE731-3 turbofan produces only 400 pounds more takeoff thrust than does the JT12A-8 turbojet, so there was not a significant amount of extra power to overcome drag. Ed Swearin-gen designed a TFE 731 installation for the JetStar. He also warped both ailerons so that the outer portions are biased slightly upward in neutral position to act as "reverse" flaps, thus forcing the inboard section of the wing to carry a greater share of the lifting loads. By designing a new fuel tank below the wing instead of wrapping it around the airfoil, Swearingen was able to reduce the size of the pod without sacrificing any fuel capacity and eliminate all nacelle flow disturbances caused by the tanks. 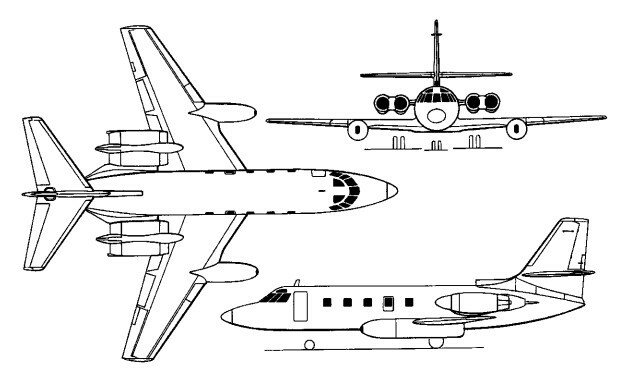 Wind-tunnel studies showed that despite its larger nacelles, the overall drag of the 731 JetStar would be slightly less than that of the original JT12A-powered version. 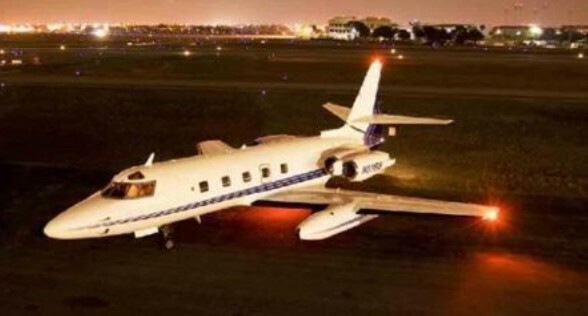 A supplemental type certificate for retro-fitting Garrett TFE 731-3s to JetStars was granted to AiResearch on June 10, 1976, nearly two years after the aircraft's first flight. Flight tests had demonstrated that the turbofan 731 JetStar exceeded the performance of its turbojet predecessor in take-off, rate of climb, initial cruise altitude and cruise speed at altitude. The 731 JetStar will go 2104 nm with full IFR reserves. Production JetStar IIs differs only slightly as, because the aircraft is newly manufactured, the aft fuselage bulkheads can be relocated, rather than modified (as they must be on the 731 JetStar), to accommodate the Garrett engines; thus the nacelle installation is about 175 pounds lighter than the AiResearch arrangement. The first production example (N5527L) of the Lockheed 1329-25 JetStar II 12-seat executive transport made its first flight at Marietta, Georgia on 18 August 1976. American Aviation Industries, founded 1985 and offered Lockheed JetStar business jet re-engining program as the FanStar.